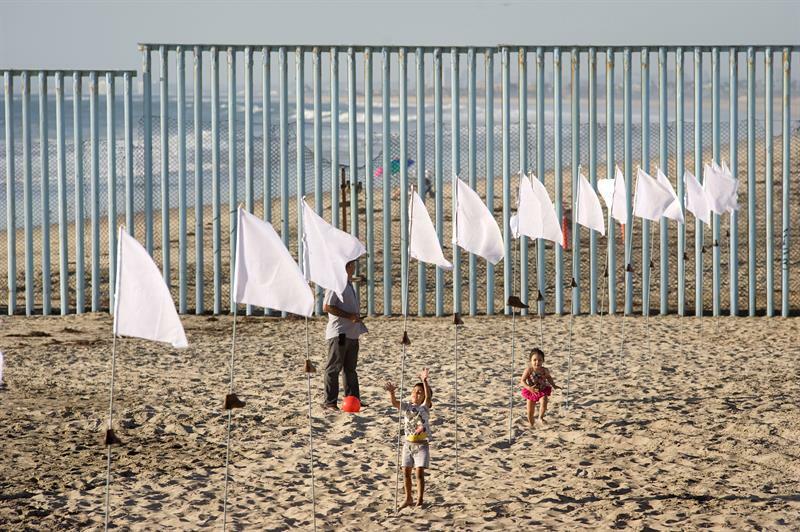 An artistic installation based on a hundred white flags placed on the sides of the wall dividing Tijuana (Mexico) and San Diego (USA) pays homage to the “spirit of peace” with which immigrants cross the border. The author of the idea, the artist Betsabeé Romero, told Efe that the anti-immigrant rhetoric and the proposal to build a border wall that promotes the current administration of the White House motivated her to create the installation “Tu huella es el camino, tu bandera is of peace “, which was inaugurated today. “Our migrants have made their way and that path has always been peaceful, it has been a path traced with their hands, with their work and their workforce,” said the Mexican. Romero said that the idea came after a shoe factory in Mexico closed its operations and opted to donate the iron to give them an artistic use, which fit with their plans to make a facility at the border. “I did not really have permission or logistics and everything has been done with the magic of people helping us,” he said. This itinerant exhibit was first installed last May, on the border between Ciudad Juárez, in Mexico, and Texan El Paso, after which it now rests on the border between California and Tijuana, specifically in the section where the wall reaches the beach and where it will remain this weekend. The next stop will be at the border between the Mexican city Agua Prieta and Douglas, in Arizona, according to the artist.